Inversion therapy has been around for years. In fact, it has been around the time of Hippocrates, The Father of Medicine, way back in 4000 B.C. He concluded that positioning his patients into an inverted position is beneficial for the circulation of the blood to the whole body including the brain and improves digestion. Inversion tables have been a great tool to relieve back pains and muscle tensions of many adults and especially senior citizens. That’s why there are many Inversion Tables are being made and developed every year. The Teeter Hang-Ups EP-970 is one of the most popular (and the most expensive) Inversion tables that is available on the online market today. So, it’s only fitting to give this product a review to see if it’s actually worth the money. The design of this product is much like its previous version, the Ep-960, but with more features and improvements. They have learned much from the flaws and weak points of the previous model that gave this one an upgrade. They’ve added an extended handle that would make it more easier to position himself/herself on the device and is also used for the locking of the ankle supports. The assembly of this inversion table is easy and would only take about 30 minutes considering there are no mistakes and it would only take just 5 steps for the EP-970 to be done. There is a instructional DVD that comes with the unit that contains information about the assembly and how the unit work so there are no worries. The unit’s weight is about 70 pounds. That means the person who’s assembling it would definitely need an assistant to help him/her out to prevent any further injuries to his/her back. The Teeter brand has been known to be making Inversion Machines since 1981 so there’s a great reputation and reliance that backs up their every product. Probably the main reason why the product is so expensive is that the components are made of steel but are harder and thicker to give their products more safety and stability. ACUPRESSURE NODES – The ComforTrak bed acupressure nodes and lumbar bridges are specifically placed in areas on the back that would give the extra feel that the person is being massaged and also adds some healing pressure while being inverted. STRETCH MAX HANDLES – They provide more options of how the person wants to stretch and has an extra long grip surface for easy access. DELUXE EZ-REACH ANKLE – This extended handle is conveniently placed just below the knee area that has access to the locks on the ankles so the person using the unit doesn’t need to bend down and reach his ankles and lock them in place. COMFORT AND SUPPORT – The ankle cups are padded and is ergonomically maneuverable that can be moved at many different angles. The contoured bed allows flexibility so it moves along with the person as he/she is inverted. FDA REGISTERED 510K MEDICAL DEVICE – This approval means that the EP-970 works because it’s been tested and passed the very strict standards of the Dept. of Health and Human Services, FDA and is now trusted by medical professionals. WARRANTY – Like all of the Teeter models, It has a full 5 year warranty that guarantees its components and materials will not fail when it’s in use. This provides the customers who buy the Teeter models some assurance that their products are built to last. The EP-970 is built to hold an average person up to 300 pounds and a height range of 4’8″ to 6’6″. The steel beams that are used in the product are heat-treated to be extra tough especially on the stress points where the strength of the material is vital. This is also the reason why the product is fairly heavy because of all the extra steel. After use of the product, it can be folded with the quickest of ease and be stored easily. The space needed for this product is not very much because it could be stored in most closets. The footprint of the product can also be folded to give some extra space when it’s stored. Because this device is FDA approved, It assures the user that he/she is safe the whole time and the unit will neither slip uncontrollably nor fail at any part of the unit. The manufacturers of the unit spared no expense in strengthening every part of it so not bolt or nut will break apart. Be sure though that the assembly of the product is secure and is done accordingly to what the instruction video or manual says. The Teeter Hang Ups EP-970 provides the best value for your money. Not only does the device gives you the relief from back pains and muscle tension but also a variety of back problems including Degenerative Disc Disease, Sciatica, Herniated Discs, Spinal Curvature due to tight muscles, Spinal Stenosis, Facet Syndrome and Muscle Spasms. It has the best safety features and comfort compared to any other Inversion Tables out there on the market. The unit is expensive compared to other models because of the extra steel. And, because of this steel, It’s also heavy. There are also reviews of customers that bought the product that it chafes the skin especially on the ankles. The unit also need a wide area when it is being used so the footprint would not slip. Inversion Therapy Machines have been very beneficial to many people. Some people nowadays could not walk or stand up straight with these machines. They have become a very useful instrument for people to live healthy lives. 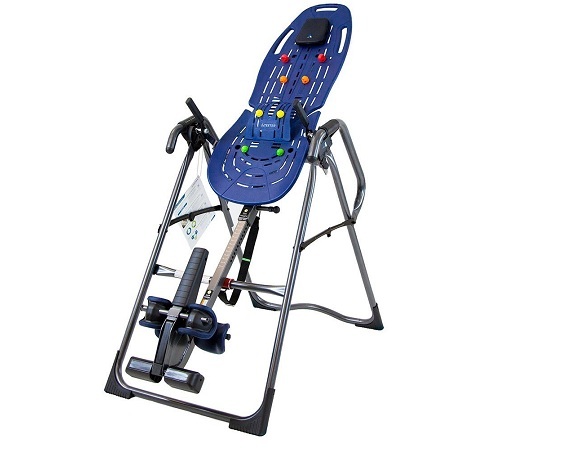 The Teeter Hang-Ups EP-970 Ltd Inversion Table is just one of these tools that make it happen. Not only it provides the best comfort and relief for all of your back problems, but also gives you the promise that you’re in good, safe hands when you’re using it.